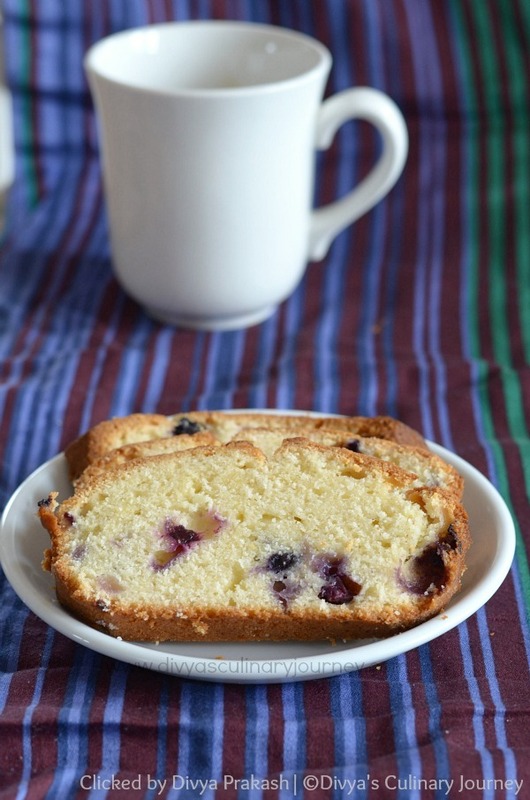 Today I am posting Lemon Blueberry bread. 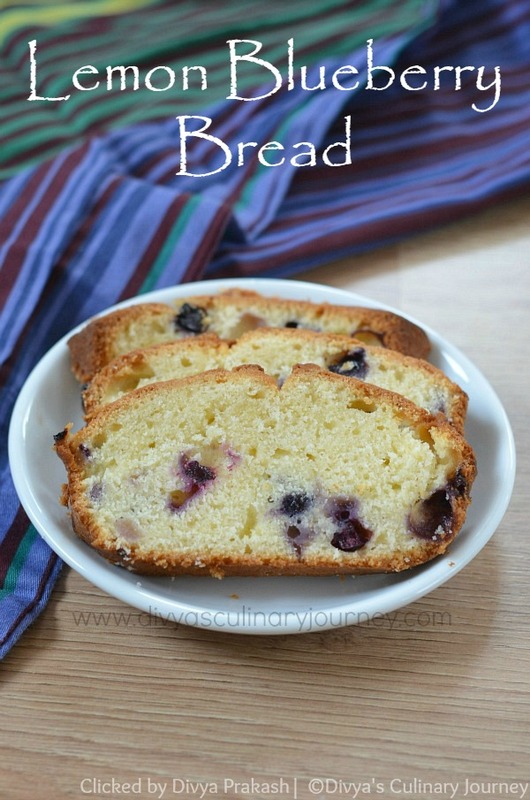 This is a soft and moist bread with lemon flavor. It may sound funny but what inspired me to use lemon zest was seeing Ina garten and Giada using lemon zest in their cooking shows. 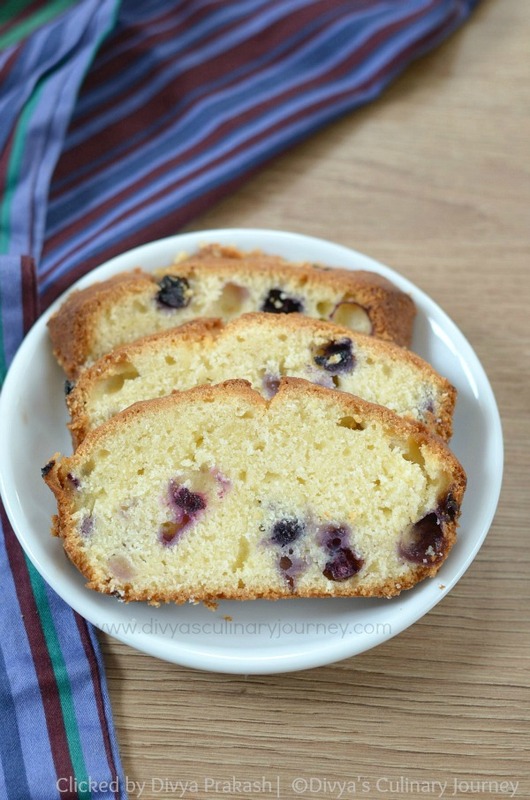 I started browsing for recipe ideas and found this lemon blueberry bread in Joy of Baking. When I baked this for the first time itself, the bread came out soft and delicious. My kids loved it too. Preheat the oven to 350 F. Grease and flour the loaf pan (9*5) and keep it ready. In a bowl, combine flour, baking powder, salt and lemon zest and keep it aside. In another bowl, with a hand mixer, cream together butter and sugar until they are fluffy and add one egg at a time and beat well, then stir in vanilla extract and add 1/3 of flour and 1/2 of milk and mix and another 1/3 of the flour and rest of the milk and then the rest of the flour and mix only till they are combined. Donot over mix. Finally fold in the blueberries. Pour the batter to the prepared pan and bake for 50 - 60 minutes until the bread is golden brown and the toothpick inserted in the centre comes out clean. Toss the blueberries in a tablespoon of flour before adding to the batter, to avoid them from sinking to the bottom while baking. Check the time of baking as it varies from oven to oven. Updated on 20th October, 2015: I have baked this bread so many times now. Everytime it comes out delicious. The last time when I baked I didn't have milk, so as a substitute for milk, I used 1/4 cup of thick yogurt mixed with 1/4 cup of water. The bread came out as delicious as usual. I like lemon zest in my bakes. lemon zest always brightens the flavor of anything it is added to..even things you would not think it would be appropriate like soup etc. - add a little lemon zest and the flavor is enhanced - it does not have to be strong and taste lemony but it always does the trick..a little goes a long way! I too like lemon flavor in cakes. cake looks so soft and yumm. Blueberries and lemon go well together, yummy. Simply love citrus flavours in bread, i wont mind to a slice rite now.. 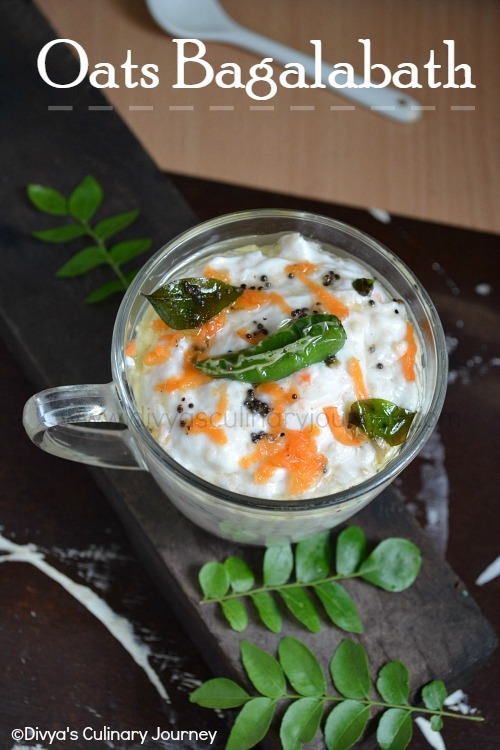 Awesome combo,sure must have tasted delicious. awsum bread with lovely colors and flavors..like everything about it...except eggs:(..how do I make it eggless? I love blueberries in baked goodies. This looks fab. I love blueberries.The lemon flavor does wonders in breads / cakes..nice combo..